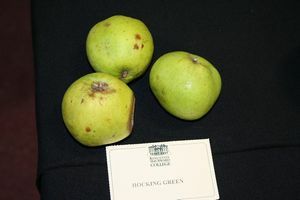 Hocking's Green - Apple Tree £12.75 - Dual Purpose Apples Apple Trees and Fruit Trees For Sale. Buy at competitive prices with wholesale discounts. Hockings Green is a hardy dual purpose apple tree that can withstand wet and windy weather. As well as being resistant to canker it keeps well and can still be used at Christmas time. It keeps it's shape when cooked making it good for tarts (see our blog for recipes). This is a classic English variety found in Callington, Cornwall.